Whether you’ve found the perfect life mate or not, there are three financial goals that everyone should work on before they walk down the aisle. Marriage is truly a blessing, but finances are the number one item couples argue about. It’s no secret that millions of people are in debt. Whether it be credit card debt, student loan debt, or a car loan, figure out how much debt you’ve accumulated in your time of singleness. You may think you’re doing okay by making on-time payments for all of your debts, but every extra payment can be a potential strain on your finances when you’re married. While you’re engaged, try working extra side jobs to pay off as much extra debt as possible. If you’re single or dating, this is also a good idea to do. Love should not depend on someone’s financial situation, but it’s important to know your future spouse’s debt before setting a wedding date. Your future spouse should be encouraged to pay off their extra debt, too. Even if you’re still young and in love, there’s no time like now to start a retirement fund. If you can manage to deposit $1,000 in a Roth IRA, you’ll be off to a great start. If you have a full time job, you should take advantage of having a small percentage of your paycheck put aside to a 401(K). If your company matches your contributions, you’ll be earning free money toward your retirement. While this step may seem like one you can dismiss until after the honeymoon is over, think again. In the first years of marriage, it seems like a new expense pops up every week. The extra expenses that seem tied to being a newlywed makes it tempting not to save for the future. 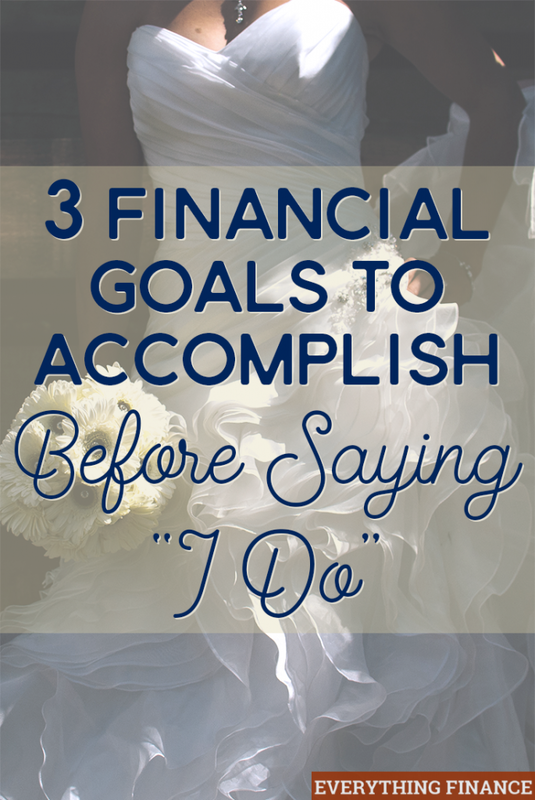 Another wise goal to accomplish before you get married is to have a savings account and emergency fund started. These should not be the same account. What has worked for me, and what I personally recommend, is having an emergency fund started at another bank. My husband and I bank at Chase, but I started our emergency fund account at Wells Fargo. This account is only a savings account without a checking account or debit cards attached. If we want to take money out of the account, we actually have to walk into the bank and stand in line (which is more of a hassle than it seems). This keeps us from dipping into the account unless a true emergency occurs. For a savings account, I recommend Capital One 360, as you can open multiple savings accounts for each of your goals. Marriage is a fun and exciting time for anyone, but it also comes with a new world of money management. These three goals will put both you and your spouse on the right financial foot before you walk down the aisle. What is the smartest financial move you made before you got married, or what do you wish you would have done before saying, “I Do”? Are grocery prices going up?